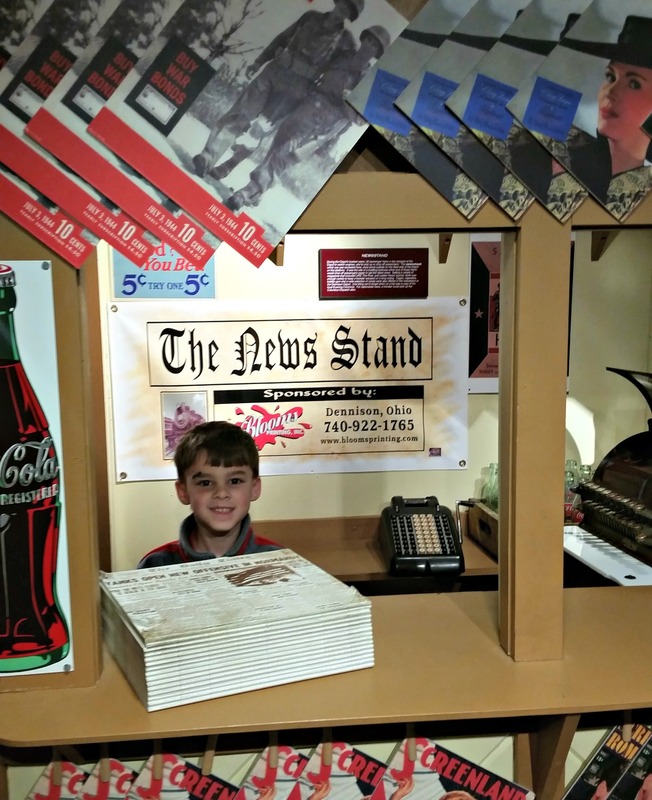 It’s not often that you visit a historical museum that is equal parts fun for the kids AND interesting for adults. 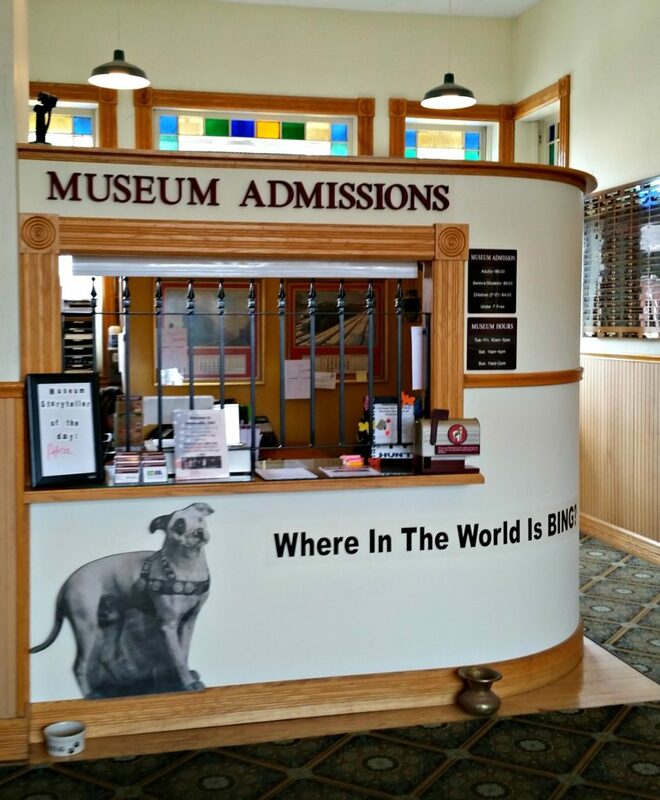 Dennison Railroad Depot Museum fits the description and more. One of the perks of the Railroad Depot Museum is that for kids under 7- admission is FREE. Kids are also given a scavenger hunt to help, Bing (the railway dog), to find all of his bones. On top of this, they receive a dog-tag style necklace and earn a charm once they completed the hunt. This interactive play helped my kids learn about the railway in a fun way! The museum contains many hands-on displays. (Here’s Jackson acting as a newspaper boy). There were cranks to maneuver and lights to operate. The kids played with kitchen toys in the kitchen car. This helped gain their interest, even at their young ages. What I didn’t realize was how big of a role the Dennison stop played in WWII. Not only was the rail station a Salvation Army canteen, the line was located in a strategic location for troops going west for training or east for departure overseas. 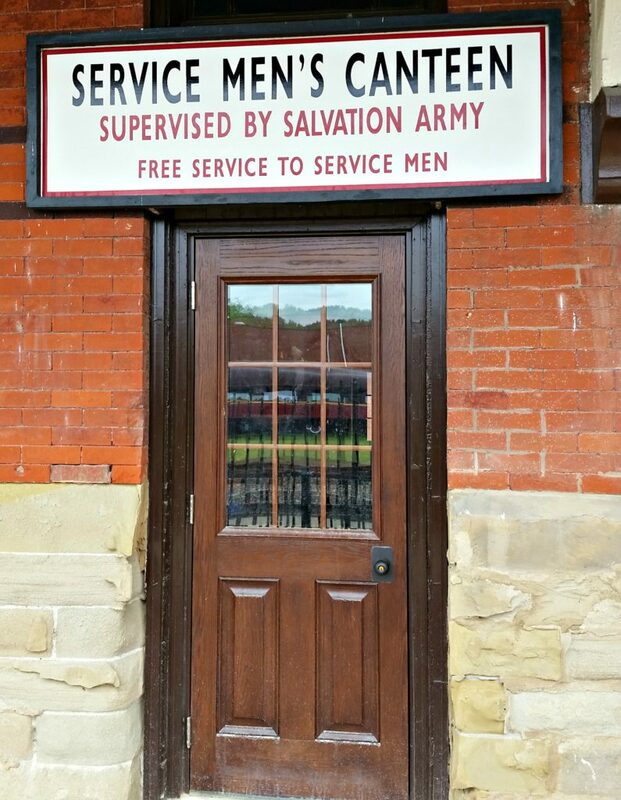 Overall, the canteen (and the station) served over 1.5 million US troops. The photographs and antiques from this time made this a nostalgic destination for my mother and me, who heard my grandma tell so many stories about the war and the role my grandfather and great uncles played in it. We even wondered if they, too, had passed through the Dennison depot? Exiting the museum, there is a caboose for children to play on (it was a little rough but may be better for older kids) and also picnic tables. While we were visiting the adjoining restaurant was closed, but it appears it has reopened. We ate lunch at the Dennison Yard Italian Tavern where the kids’ meal is a build-your-own pizza! 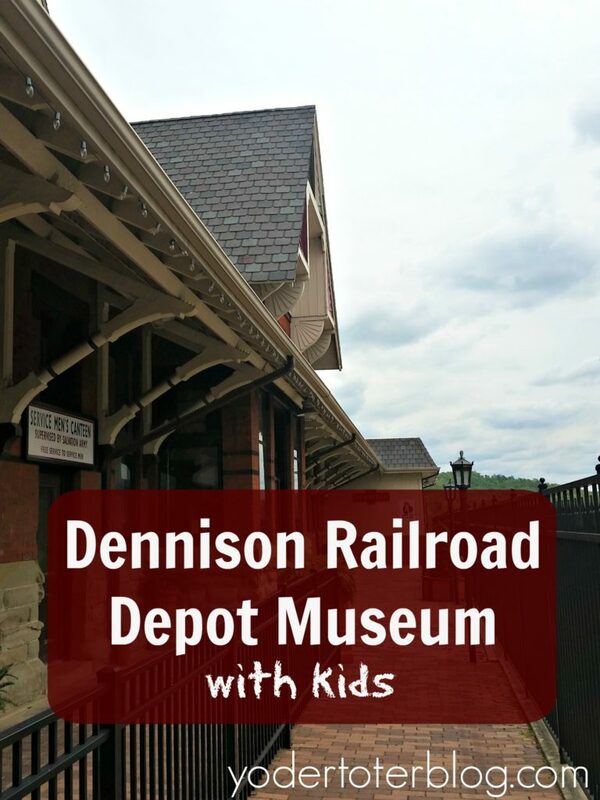 The kid-friendly Dennison Railroad Depot Museum is only 45 minutes from Berlin, OH. This would be a great excursion from Amish Country! The museum is well-suited for all ages, so bring the little ones AND grandma and grandpa. The depot is largely handicap-accessible BUT because much of the museum takes place inside train cars, we did NOT use a stroller here and I wouldn’t really recommend it. If you have a little baby or toddler, a baby carrier would be best. 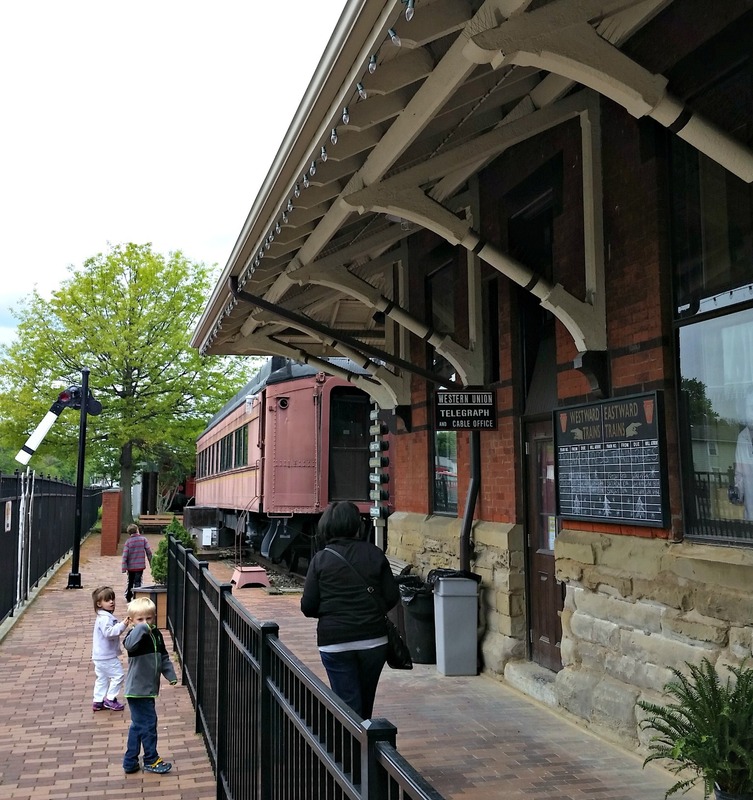 Dennison Railroad Depot is not just a museum, they offer many special events throughout the year. The most popular with families is The Polar Express. Check out their website for more info. Homeschoolers- studying WWII history OR the role of railroads in the 20th century? This is a must-see. Put the Dennison Railroad Depot Museum on your Ohio Bucket List! Kids of all ages will enjoy it. Thank you so much for coming!! !